Carlota Maria Roybal passed away April 11, 2018, at the age of 93 in Santa Fe following a brief illness. She was preceded in death by her sons; Phillip, Julian and Andrew; brothers; Claudio, Amado, Estevan and Celestino; sisters; Orcilia and Agripiana. She is survived by her sisters; Laura Medina and Eloisa Garcia. She is survived by her husband of 70 years, Jose Eleveo; daughters; Margaret Roybal Wilson, husband Louis; and Lorraine Peck, husband George; daughters-in-law; Mary Roybal and Yolanda Roybal. She is survived by her grandchildren; Jeannette Gallegos, husband Paul, Michael Roybal, Jennifer Roybal, Jessica Roybal, Carolyn Peck and Ashley Peck; and great grandchildren; Devonne Lopez, husband Antonio; Jaron Ruiz, Alyssa Ruiz, Elijah Roybal, Damian Roybal, Marissa Gallegos, Mark Gallegos; and great great-grandchildren; Rosalie and Isabella Lopez. Carlota was born on June 6, 1924 in Dixon, New Mexico, to Celso and Frutosa Archuleta. She was a faithful servant of our Lord Jesus Christ. 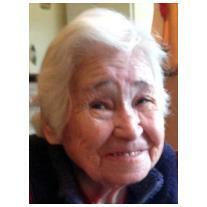 Carlota was a devoted wife, loving mother and grandmother. She was a wonderful cook and had a great sense of humor. She had a beautiful, kind and generous heart. She was always joyful and lived life to the fullest. Carlota will deeply be missed, but she will live on in our hearts.